The yellow fly is a fierce biter that resides near water and in or near forests – all places we humans want to be in the hot summer months. Conventional insect repellents like DEET work on mosquitoes and other bugs by disrupting their ability to sense carbon dioxide. Yellow files are also attracted by the movement, warmth, and size of warm-blooded animals, rendering conventional repellents useless and making active humans easy targets for these bloodsucking pests. NEW Yellow Fly Stoppers beat these nasty biters at their own game. Simply apply one of the adhesive strips to the back of a hat and you’re good to go. Easy, safe and effective. 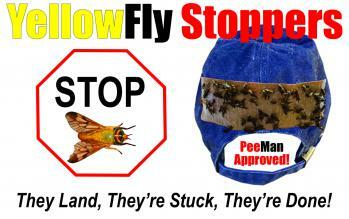 The flies can’t resist the flesh-colored yellow fly traps – they land, they’re stuck, they’re done. Use Yellow Fly Stoppers to get back to enjoying the beach, hikes in the woods or other summer outdoor activities. PeeMan Approved. 6 pack of super-sticky adhesive yellow fly attracting strips. Simply apply strip to the back of your hat and go. When strip is full, remove, discard and replace. Take back your summer fun!